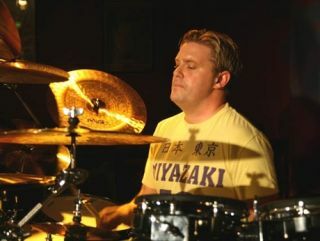 Craig Blundell is offering a unique opportunity for drummers to bust out their creative side and come up with a brand new design for his kit. The versatile sticksman has joined together with the guys at Pimpco to launch a competition to design the finish of the Mapex Orion kit which will be used on prog supergroup Frost's 2010 tour. The only criteria is that the colour of the design is blue and white, giving you plenty of free reign to come up with an awesome, eye-catching look for the set. As if that wasn't a good enough reason to enter, the winner will also meet the band at their 3 December London show and will even take up the role as Craig's tech for the night. Which is a pretty cool way to spend the evening, and presumably means Craig's tech will get to put his feet up and have the night off. So everybody wins. All you need to do to enter is to send a high res image of your design as a PDF or JPG to sales@pimpco.co.uk. Good luck!